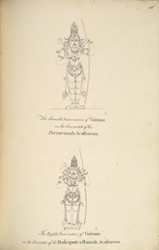 Pen and ink drawings depicting Parasurama and Balarama, from an 'Album of 51 drawings (57 folios) of buildings, sculpture and paintings in the temple and choultry of Tirumala Nayyak at Madura. c.1801-05', by an anonymous artist working in the South India/Madurai style, c. 1801-1805. Each picture is inscribed with a title and a number in ink. These drawings are from a carving that can be found in the Minakshi Sundareshvara Temple of Madurai, the sacred complex built under the patronage of the Nayaka ruler Tirumala in the 17th century. Within the large enclosure are two temples dedicated to Shiva as Sundareshvara with his consort Minakshi, and several mandapas (halls) with elaborately sculpted columns of the gods from the Hindu pantheon. Parasurama, 'Rama with axe', is the sixth incarnation of Vishnu. He is remembered as helping to restore the social order disrupted by conflicts between the warrior clans of the kshatriyas and the Brahmans. Balarama is occasionally listed as an incarnation of Vishnu, but more often than not is considered to be the elder brother of Krishna with whom he has shared in some of his adventures. He is also occasionally regarded as the incarnation of the cosmic snake Shesha.